“As part of various job roles, a recurring routine work can be done which can be unique, have start and end date and can have a unique result. For example a software developer can write a program every day i.e. he begins writing the program in the morning and completes it the same day to provide adhoc reporting for different users for different purposes. Assume that his daily work is to support different applications and some times the adhoc reporting is part of his support work, and some times some adhoc reports fall outside the scope of his daily work. In the PMP exam, there are some questions that will test you in similar scenarios, asking you if you understand the differences between Projects and Operations. So I thought to explain this to all the PMChamp PMP Tips readers preparing for the PMP exam. According to the PMBOK Guide, Sixth Edition, a Project is a temporary endeavor undertaken to create a unique product, service or result. Temporary means having a definite beginning and end. The end is reached when the project’s objectives have been achieved, or if the project is terminated for any reason. Secondly, each project creates a unique product, service or result. 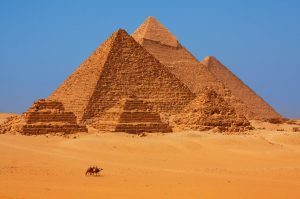 Sure, there may be some repetitive elements present in each project, but the output must be unique – like similar housing projects in the same area with the same design may be similar, but each will have unique challenges, different contractors, issues, etc. that will make them each unique. An ongoing work effort is generally a repetitive process because it follows an organization’s existing procedures. The ongoing execution of activities that produce the same result or product repetitively is what Operations is all about. Production operations, accounting operations, manufacturing a product are all Operational activities. Operations are permanent initiatives that produce repetitive results, with resources assigned to do the same set of tasks and produce a standard output. In the life of a product, there will be many projects to improve the product, add new features etc. and these projects will come and go as required. The underlying production of the product will continue as usual, although there will be refinements done and included in the product over the period. 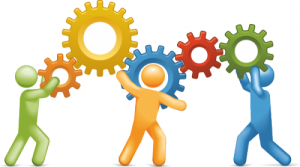 Projects require project management, while operations require business process management or operations management. Projects and Operations will interact with each other at key points in a product’s life cycle. Operations are ongoing, but projects are temporary. Both projects and operations are carried out by people, both require planning, both require management, and both are constrained by a fixed amount of budget, resources, and timelines. Example of Project / Operations : A plumber may be doing a support work to fix a leak. Each day he fixes leaks in 20 locations. Each leak may require a different solution (some may need a new washer, or a new pipe, or some putty), but it is still support work. But let’s say during a leak fix, he realizes that the whole tubing is weak, damaged at many locations, and is going to explode at any time. Thus, he informs the home owner that a “Redesign the bathroom” project should be undertaken if you want a permanent fix, and the plumber can then give the details of the work required (scope), and a quotation (budget), and estimated time to fix the whole thing (schedule). If the home owner (Sponsor) agrees to the time/cost/scope, a “remodel the bathroom” project is born. If not, then the “fix the leak” support ticket is completed and closed with the required documentation updates (payments, sign-off). So for the question raised earlier… It is support or project work? Supporting users is an operational work, and there may be a Help Desk or a Support team whose job is to settle the user’s ad-hoc requirements. Most of these will fall into routine tasks – creating a user id, restoring a forgotten password, adding access control, fixing duplicates, fixing any encountered bugs, and teaching common functions. However, some support requests may turn out to be too big, or too difficult to do, or may be beyond the scope of the support team. This might require the project team to be roped in. They will scope the requirements, look at the benefits, and then work out a time/cost estimate. If the budget can be found through a sponsor, this can become a project. other wise, it can stay as a support ticket that is completed, closed or deferred for future. It sounds simple, and it is. Just read the question carefully in the PMP exam, and then identify from the situation if it is a unique project or an ongoing operation. PMChamp Online PMP Coaching Program celebrates 7 successful years! 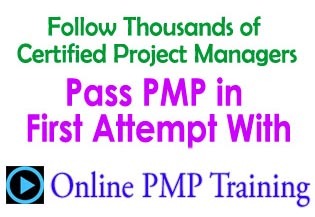 Over 12,860 students have used it to pass their PMP exam. Read some of the PMP success stories. What are you waiting for? Get started today in your journey to be a Certified Project Manager. P.S. Do you know how to study & prepare for the PMP exam? Check out our detailed PMP Study plan – Sample provided for your use. Why do you want to achieve PMP certification? Work Matters. Make a Difference! Is Improving Support Function a Project? The Article here is quite well written but I have a Q. It’s quite clear that Support is an operation but if someone has to work on improving the Support function will that be a project or an operation. For example, it could happen that a Customer Support Manager needs to work on increasing the efficiency of the CSRs by may be starting an incentive scheme or providing better training, etc. Now each of these could be individually looked at as projects too right but if you see it in the larger light, aren’t these part of a regular operation itself. Thanks for this question. I am sure many people working is Support/operations have similar questions. Yes, improvements to any area/process can be taken as a project. This is only true if the scope of the improvement is clear/tangible/achievable, is time bound and specific. For example, improving the customer satisfaction index from 4.1 to 3.1 in the next 3 months. We should not be worried about it not being a project just because we are improving the support/customer service area. As long as the scope is clear, and has a definite begin/end date, and/or result, it is fine. I’ll write a separate post to elaborate more on this. Great article. I have a question I have been having a debate with some coworkers on. We have a request to turn off and on a service of an application we support. The cause is a data conversion from a project and that project has requested that the service be stopped and started at a certain time. We are also billing for this work even though it might be very minor. Some people think this is operational task and I think it is a project task because while the work is operational in nature the reason or cause is because of project. This to be is a work package for the support team to work on for the project. Please let me know your thoughts on this. I think it is operational work only. This is quite small, and all you need to do is to switch on and off it at specific times. It does not need specific planning, executing, monitoring etc. This seems to be an operational step that may be triggered by some project activities. hope this helps… All the Best! – Vinai. 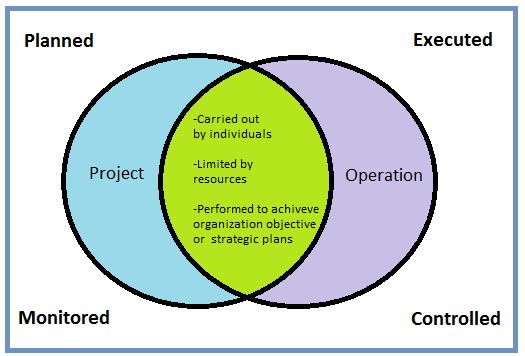 Good examples of the difference between operations and projects. Thanks! Thanks for the appreciation Kenneth. Glad you liked it! it’s really a good example to differentiate the projects and operations.